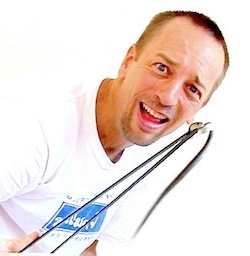 Great website, excellent tips for people like me living in Thailand ! That wasn’t a mouse, that was a hamster.. Lol hope that wasn’t the girlfriend or the kids pet placed in there by mistake! If it was a mouse it would have had a longer tail. 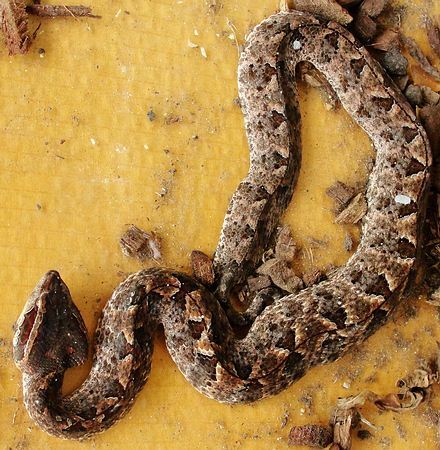 Nearly trod on a viper (looked kind of like this) at night in Laos years ago. Was barefoot waiting for a sandwich and there it was. The sandwich lady chopped it with her meat cleaver. Lucky escape…..not for the viper. Yep, caution at night is highly advised in Southeast Asia! Glad you didn’t get a bite. I had an encounter with this early one morning last week while sweeping up the leaves in my garden in Bangsaen. I was concentrating on sweeping the area around my feet and was paying no attention to my immediate surroundings when I suddenly I came upon it. And there is was at my feet! It must have seen or sensed I was walking nearer and nearer but obviously had made no attempt to move from its curled position. I was only aware that it was there when I saw it jump at the broom which I guess might have actually touched it. I moved back pretty dam quickly as I was aware it was dangerous and cursed myself for being so careless. The snake itself returned to its previous curled position and made no attempt to leave. Pretty much sums up the characteristic of this species I guess. 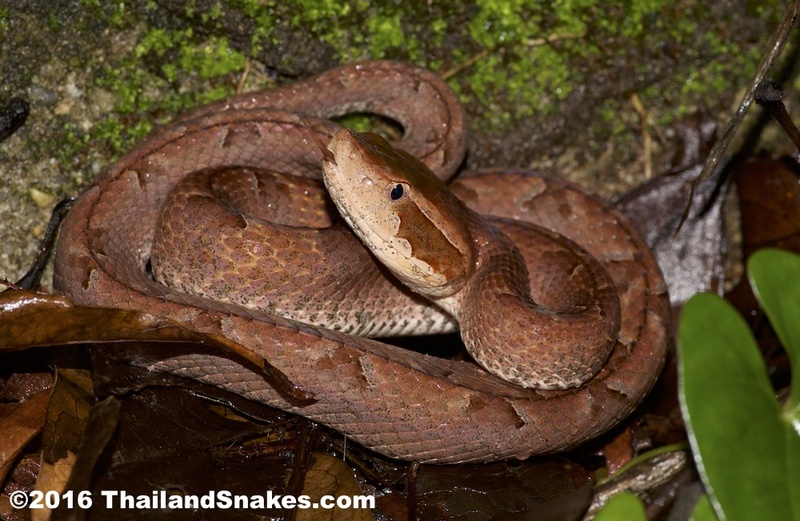 Classic Malayan pit viper… sit there and wait for something to come by – even people. Good that you knew what it was and gave it some space fast! 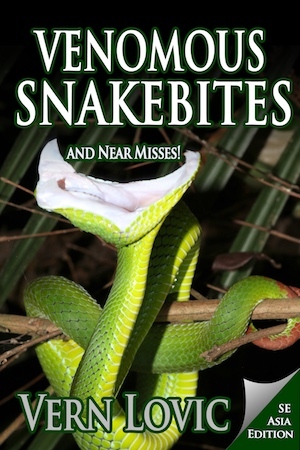 what’s the name of the snake on the cover of the book? Oriental whip snake. Ahaetulla prasina. Harmless and very common here. A very mild venom. I recently found two snakes in our water tank about 30 cm long with red bellies with pronounced black spots. 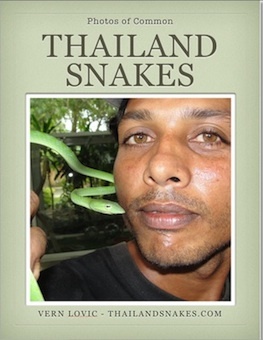 The snakes to me looked like keelbacks, but it was hard to tell due to their small size. 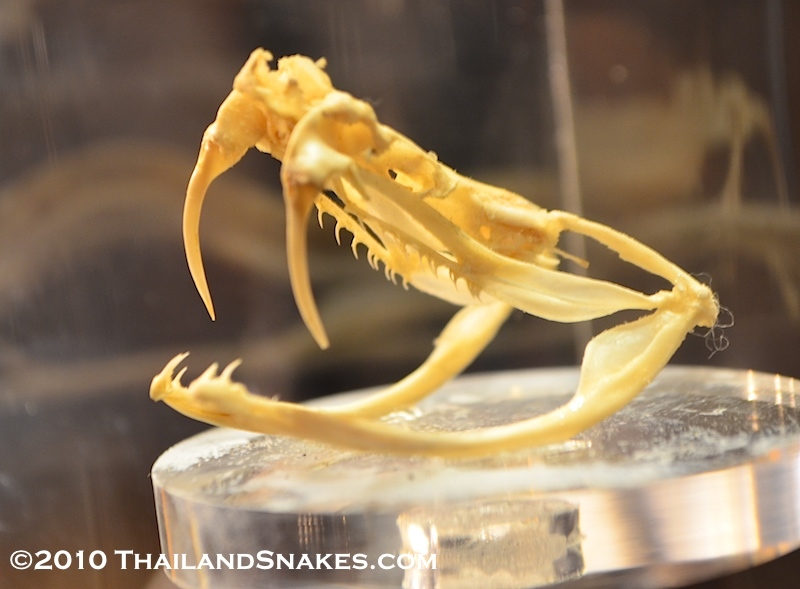 My Thai wife says they were Malayan pit vipers, but I cannot find any information or pics on this anywhere. Does anybody here have a clue? I live in the Tak province, not far from Sukhothai. Any leads would be greatly appreciated. Sounds like one of the kukri snakes, or a coral snake. Explain more about the red belly and black spots – and where are the black spots? What does the top look like? (My wife and I actually). 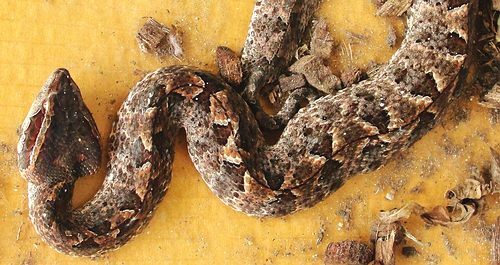 Do Malayan pit vipers climb walls? 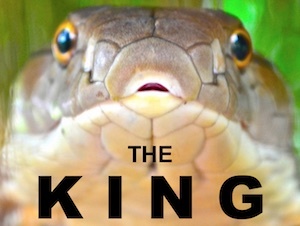 They are primarily ground snakes – terrestrial. 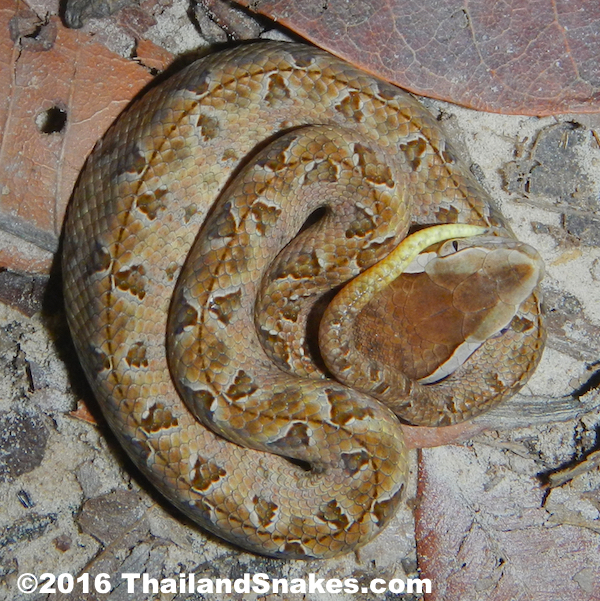 I have never seen a Malayan pit viper on top of something – only on ground, rock, and under leaves. Do they EVER climb? I don’t know. Any snake can climb to some degree, but my guess is that nobody has ever seen a MPV climbing a vertical wall. :) Cheers! Had to dispatch 2 malayan pit vipers in two consecutive days at my house. Not seen one for months then two in two days. Do they live in groups? Any ideas to get rid or trap only I have 2 young children staying. Maybe buy a pair of Tongs online. 40 Inches is standard. 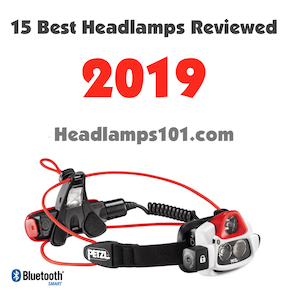 Walk around at night with a strong headlamp and try to find them. They don’t tend to stay in groups. Get rid of frogs and rats – any rodent – around your home. had a young one come into the house once . . . . it was about 9-12 inches long . . . . tonight had a good sized female on the back patio . . . . hope that’s the last we see of them . . . . Think I was bitten by mpv in Pattaya in 1995. I reckon I must have stepped over it on the way to fix our flood prevention sand bags at our front gate. On the way back into the house it struck me on the tip of my big toe. Pain was excruciating. Luckily was rushed to Bangkok Pattaya Hospital. Meanwhile my local neighbours killed it and followed me to hospital. I actually identified it on a chart in A&E admittance which was confirmed when doctors received the dead snake. Was quickly given anti venom around one hour after the event then spent 3 days in hospital. Very scary but guess I was lucky – could have been worse. Hi Archie, yep, it could have been much worse. What sort of necrosis occurred at the bite site? How much tissue did you lose?